Perovskite materials have shown great promise for use in next-generation solar cells, light-emitting devices (LEDs), sensors, and other applications, but their instability remains a critical limitation. Researchers at UC Santa Cruz attacked this problem by focusing on perovskite nanocrystals, in which the instability problems are magnified by the large surface area of the particles relative to their volume. Atoms on the surface are vulnerable to reactions that can degrade the material, so molecules that bind to the surface--called surface ligands or capping ligands--are used both to stabilize perovskite nanocrystals and to control their properties. In a paper published June 13 in Angewandte Chemie, the UCSC researchers reported the results of experiments using unique branched ligands to synthesize perovskite nanocrystals with greatly improved stability and uniform particle size. "This new strategy to stabilize organometal-halide perovskites is an important step in the right direction," said corresponding author Jin Zhang, professor of chemistry and biochemistry at UC Santa Cruz. "Our hope is that this could be used not only for perovskite nanocrystals but also for bulk materials and thin films used in applications such as photovoltaics." 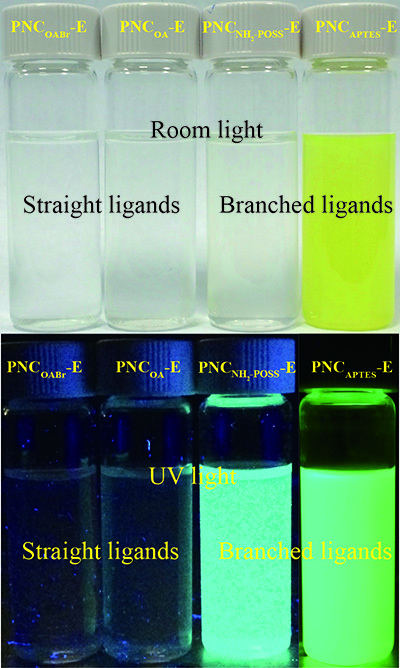 Zhang's team tested the effects of different types of capping ligands on the stability of perovskite nanocrystals. Conventional perovskite nanocrystals capped with ligands consisting of long straight-chain amines show poor stability in solvents such as water and alcohol. Zhang's lab identified unique branched molecules that proved much more effective as capping ligands. According to Zhang, the branching structure of the ligands protects the surface of the nanocrystals by occupying more space than straight-chain molecules, creating a mechanical barrier through an effect known as steric hindrance. "The branching molecules are more cone-shaped, which increases steric hindrance and makes it harder for the solvent to access the surface of the nanocrystals," he said. The researchers were able to control the size of the nanocrystals by adjusting the amount of branched capping ligands used during synthesis. They could obtain uniform perovskite nanocrystals in sizes ranging from 2.5 to 100 nanometers, with high photoluminescence quantum yield, a measure of fluorescence that is critical to the performance of perovskites in a variety of applications. Zhang's lab is exploring the use of perovskite nanocrystals in sensors to detect specific chemicals. He is also working with UC Santa Cruz physicist Sue Carter on the use of perovskite thin films in photovoltaic cells for solar energy applications. The first author of the paper on perovskite nanocrystals is Binbin Luo, a visiting researcher in Zhang's lab. Other coauthors include Ying-Chih Pu at the National University of Tainan, Taiwan; Sarah Lindley, Yi Yang, Liqiang Lu, and Yat Li at UC Santa Cruz; and Xueming Li at Chongqing University, China. This work was supported by NASA and the U.S. Department of Energy.